A beautiful Honda CX500 built by ourselves. 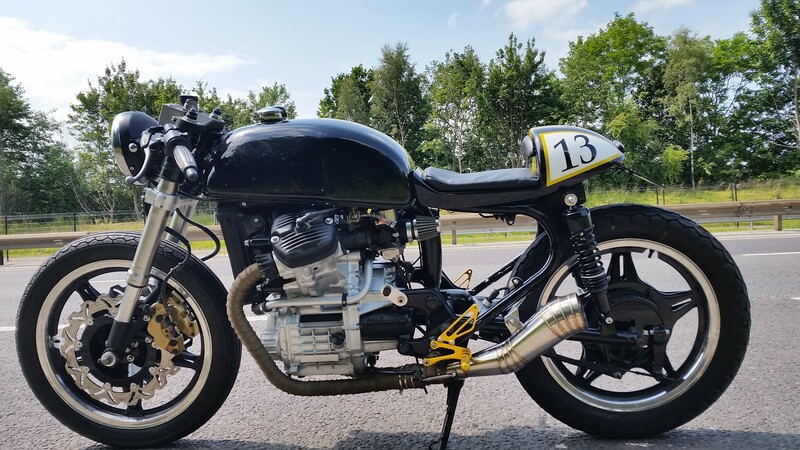 This is a fully re-built Honda CX500 1980. It was finished around July 2015 when it passed it’s MOT with flying colours! We had lots of fun putting some miles on this bike for a shake down test before we handed it over to our delighted customer! Throughout the re-build, we modified the frame to make our Complete Cafe Racer CX500 Seat Unit fit and then sent the frame off for powder coating along with the swinging arm, Yokes, side stand and many other little parts. new wheel bearings and head stock bearings were fitted. The forks and yokes are from a Fireblade 929rr with a custom wheel spindle and top hat spacers made to fit the CX front wheel (i totally hate non matching wheels – there is no need for it if the job is done properly ) custom discs are used so everything works with standard wheel and blade calipers – boy does it stop well!!. To make this a minimalistic bike a custom wiring loom was made with all the electrics hidden away in the seat hump including the lithium ion battery, clocks were not used but a mini dash with idiot lights for temperature, oil pressure, neutral and high beam. The bike sounds just as good as it looks and is now back in the hands of the Customer!